On Tuesday, September 28, I was in the audience at the Pacific Energy Center in San Francisco as Alex Wilson, Founder and Executive Editor of Environmental Building News, gave a presentation about misguided pursuits in green building. He covered all-glass buildings, building-integrated wind turbines, and residential ground source heat pumps. The post below consists of Part 2 of my record of the presentation – building-integrated wind turbines. All portions are included in chronological order. Read Part 1 here. 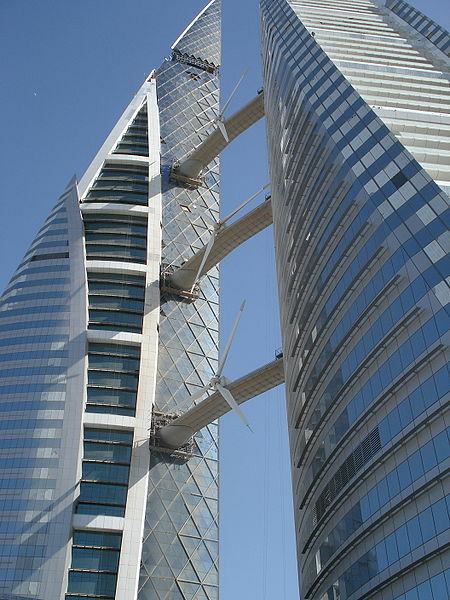 So there are mostly small system that are being done on buildings, this is a big one – Bahrain World Trade Center … 225 kW wind turbines by Norwin … harvesting wind coming off the Persian Gulf which is very consistent directionally … but I believe that if these were effective, the architect and owner would want to boast about it, instead of not releasing any information about it. Aerotecture, in Chicago … couldn’t get any data from them. The only data I could find was from the UK, 25 installations. The issues are several-fold … First, the benefits. Get a tall building, we know it’s windier up high … The electricity gets used right in the building … plus it makes a statement that you care about renewable energy and benefitting the environment. 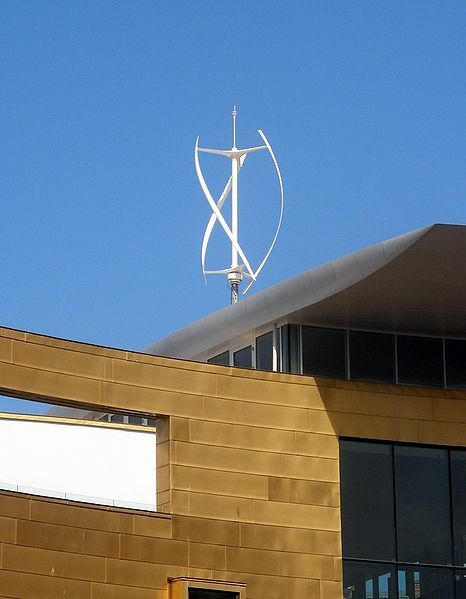 The problems are that we find the wind on top of buildings is very turbulent … wind turbines don’t like spiraling eddies. Next, the noise and vibration. Buildings, especially steel-framed commercial buildings, transmit vibrations through the superstructure … if you read the fine print of AeroVironment, they recommend them only on masonry buildings … Also the safety issue and the perception of safety … wonder if a building like the Bahrain World Trade Center, if the insurers in this country would have allowed them to put wind turbines on building where there’s the possibility of a blade coming off … like sometimes happens on a wind farm. And then there’s the issue of economy … In most cases, we’re limited to very small wind turbines. And we’ve learned that with wind turbines, there are huge economies of scale … the larger turbines are much more cost effective in terms of cost per delivered capacity … … Small wind turbines are pretty hard to justify economically even as stand-alones, and when we put them on buildings, the cost goes up significantly due to structural support and other issues. Any reputable manufacturer of a wind turbine has power curves – need to look at those very carefully … There isn’t a standardization for small wind turbines right now … you need to look at those numbers really carefully. The Boston Museum of Science is doing some really neat data collection. Someone had the idea of putting some turbines on to make power – they did some analysis and decided it didn’t make sense economically … but they decided to do it anyway and collect data … They’re using five systems … They’ve got a great display in the building … by now they probably have some published results. The results they get should probably help put to rest this question of whether it makes sense to put turbines on buildings, and should show it doesn’t. They had quite a bit of expense to be able to support the turbines … it was a lot of additional installation cost for very low output.